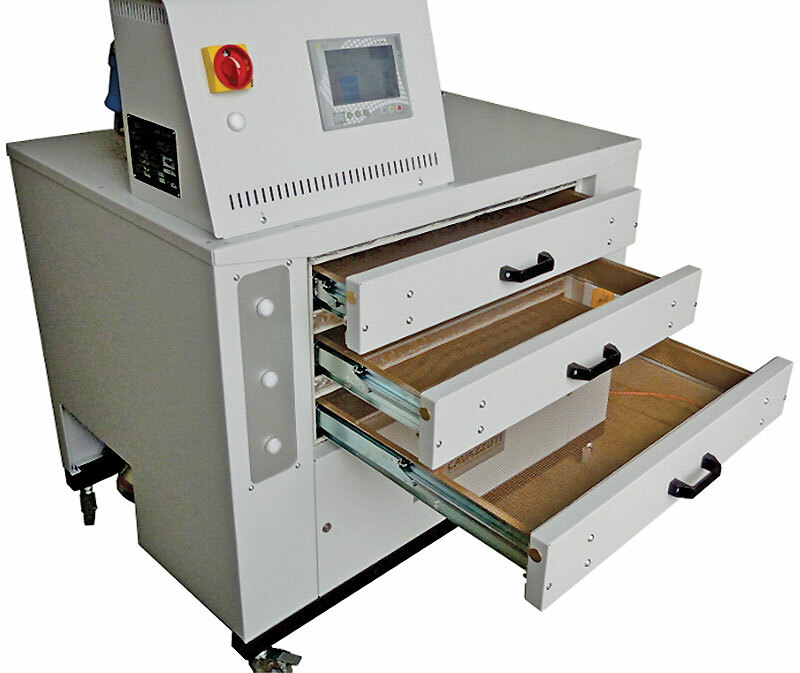 Hot air oven with drawers for drying water-based or plastisol inks. Maximum working temperature is 160°C. Air is warmed by electrical heating elements. Air is pushed in the drawer vertically in order to be everywhere uniform. Filtered air is keeping the fan and the conduct clean, improving efficiency. The oven is equipped with exhaust fumes pipe and an heat exchanger. Each drawer is independent and equipped with a timer. An easy interface with coloured touch screen is introduced. DiDO Shop is mainly studied to dry inks digitally printed on dark fabrics. It works well with generally long drying process with control of temperature and efficient air circulation, like flocked garments need. DiDO is ideal for small factories thanks to its reduced dimensions and low consumption. Hour production is approx 30 pieces with a permanence of 5-6 minutes per drawer. Perfect for fine textiles, like Lycra, wool, silk, etc… Reduced dimensions allow to pass through small doors 80 cm wide. Small power requirements permit its use also in small laboratories and shop without three phases electrical supply. Suitable for any type of digital machines. Lower price.